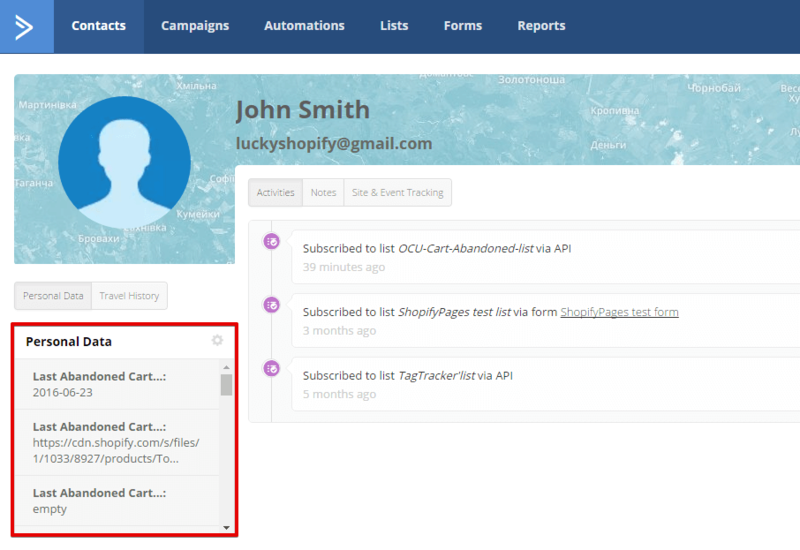 Learn how the Active Campaign integration works with the built-in Abandoned Cart feature for OCU! 1. 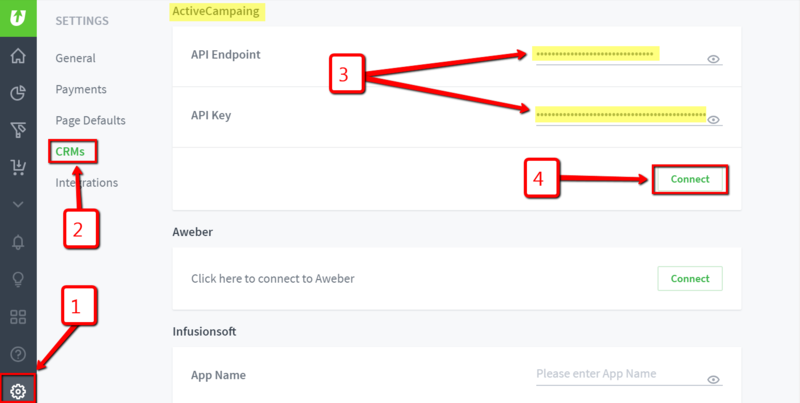 Open a web browser window/tab, then navigate to the ActiveCampaign website (http://www.activecampaign.com) and log in to your ActiveCampaign account. 2. Click on your Username in the upper-right corner to open a drop-down menu. Then click on “My Settings”. 3. In the left-hand menu, click “Developer”. 4. Under “API Access” you will see two fields. Copy the link within the “URL” field and the API key in the "Key" field. Your Active Campaign account is now connected to your OCU app via API! 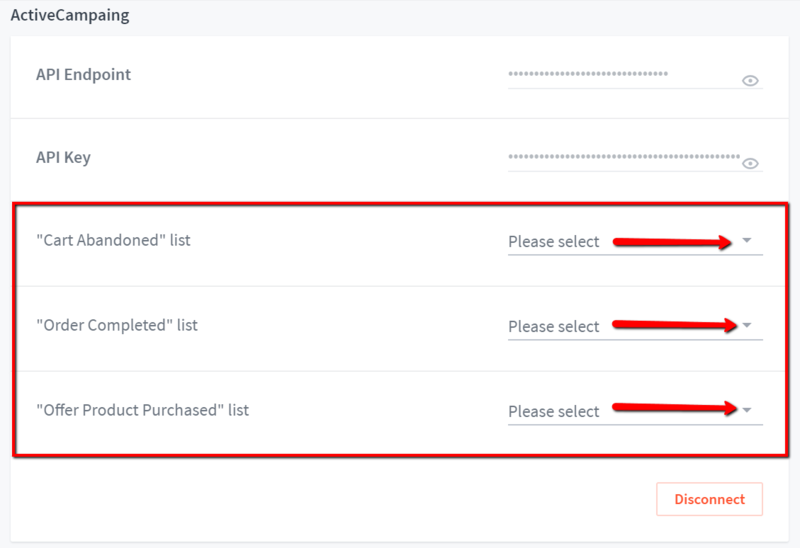 Select the desired list(s) from drop-down menus in the the fields titled “Cart Abandoned” List, “Order Completed” List and "Offer Product Purchased" List. Your ActiveCampaign lists are now connected to your OCU app! Click on the “Campaigns” tab and click “+ New Campaign”. On the Type step provide the Campaign name and select the Auto Responder type. Click on the Next button in the top-right corner. An Auto Responder will automatically send an email once a customer is added to the list. Standard allows you to send out one-time emails to groups of customers. Decide which option works better for your case. The next page allows you to choose the list to send to. You can select 1 or more lists. You can also segment the list from here. On the design step, you can create your own email template using Scratch mode and the constructor or use the prepared Templates. After you select your choice you must provide the Name, Email of sender and the Email Subject. Then click the Continue button. The Constructor allows you to make changes and add new blocks with information for prepared Templates and in Scratch mode too. In order for the field's value (OCU imported data) to appear in the email, you'll need to add fields from the list selected in the second step into the email template. Fields should be named the same way as they appear in the selected list. Use the percent symbol (%) to mark out the field like this: %field_name%. To make it more convenient, there's a "Contact" tab in the "Personalize" section of the editor which contains all fields. Add field variables into the template by selecting them with a single click! Active Campaign's characteristic is that it adds " _N " after a field's name in the case where more than 1 list contains fields with the same name. In order to get the exact name for the field (together with the identifier) you need to go into the Forms -> Manage Fields section in your AC account (use new browser tab for this). Then select the list you're creating the campaign for from the drop-down menu and it lists all fields for this list and associated Personalization Tags for them (like shown on the screenshot below). The Personalization Tag is what you need to use in the email template. When copying and pasting those values from this list, don't forget to include the '%' symbols. This condition allows you to put content into the email body only if the $FIELD_NAME field contains any value. When that field is empty it will output nothing. When you're finished, click the Next button in the header! On the summary page, you can see if there are any issues and fix them if needed. You can also send yourself a test email to ensure that it looks/works how you intended. When your campaign is ready and all issues are fixed then depending on the selected campaign's type there will be sending functions available in the upper-right corner. If the "Standard" campaign is selected there will be a "Send Now" button and emails will be sent to all customers from the list. If the "Auto Responder" campaign is selected there will be a "Finish" button which adds the campaign to the schedule to send an email to each user added to the list.